Harvest Gold Memories: Newspapers: Are They Evolving, or Devolving? Newspapers: Are They Evolving, or Devolving? In the 1990s, my hometown newspaper ("The Sentinel") which I delivered to my neighbors as a kid, was acquired by a larger daily newspaper. Before long, virtually all of the journalists and editorial staff were let go, and the paper ceased to exist, instead being folded into the bigger daily publication which promised "improved" local coverage under the new arrangement. Needless to say, the local coverage after being folded into the other paper was practically non-existent, and if the paper has one article a week about the town where my parents live, that would be a huge deal. Most people in town voted with their dollars, subscribing to a different daily paper which had better local coverage. Then, in 2009, The Sentinel was resurrected. A brand new version, completely digital, emerged. The get it off the ground, several grant foundations helped pay for the initial expenses. The editor is based locally. They learn of stories the way local newspapers did once upon a time (the old way), by hearing about things from townspeople, attending town meetings, etc. although they do use new tools, too. According to my parents, the local coverage is far better than the big city daily that acquired the old paper. Although my parents live in an area that has 3 larger daily papers covering the region, along with several weeklies that cover the town, there's something to be said for getting the news as it happens, and the new version has the added benefit of coverage as the news happens. 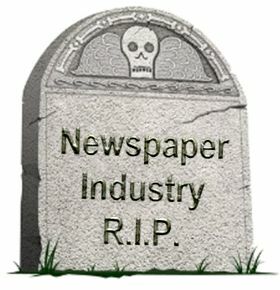 Much has been written about the death of newspapers. A lot of articles seem to suggest that technology is primarily responsible for the death of much of the newspaper industry, suggesting that electronic publishing is the wave of the future. However, that's a bit of a misrepresentation of the facts. Yes, many newspapers are struggling these days, and the industry is in a profound, seemingly neverending crisis. But the death isn't due to smartphones, its because the underlying business model changed. The thing that once paid their bills was advertising, and local newspaper advertising is struggling as companies like Google now offer the ability to target residents of a given city with local advertising, and giant online sites like Craig's List gobble up local classified ad dollars. Indeed, during one quarter last year, more than three-fourths of Google's profits were derived from advertising. Indeed, at least one major U.S. city's daily newspaper has figuratively stopped publishing: in the fall of 2012, the parent company of the New Orleans Times-Picayune, Newhouse Media, stopped printing old-fashioned newspapers (see http://nyti.ms/NZyvCZ for more), turning New Orleans into the largest U.S. city without a daily newspaper (although a number of smaller cities have already gone that route). I suspect New Orleans won't hold that title forever. To be sure, The New Orleans Times-Picayune hasn't completely disappeared, but you won't find any copies on local newsstands anymore. To read it, you'll need a computer, tablet device or smartphone (the news of it's digital migration can be read online, visit http://bit.ly/JUKFfg for details). The Times-Picayune had won Pulitzer's for it's photography of the aftermath of Hurrican Katrina. Most of the journalists and editors for the Times-Picayune were "let go". New Orleans is unique in that the city celebrates death like few other locations on earth. Needless to say, when the last print edition of the Times-Picayune rolled off the presses, there was a big party. But it wasn't really a celebration, it was more like a memorial service. With a staff of more than 200 employees, ranging from reporters to the guys who operated the printing presses all losing their jobs, just WHO is gathering the news stories for the new Times-Picayune is unclear. Critics say the coverage isn't what it used to be, and few believe there will be more Pulitzer's for the publication. This sounds ... sort of okay. But while there's a lot on corporate reorganization, there’s nothing on how this will work in practice. "Combining the award-winning journalism of The Times-Picayune and the strength of NOLA.com" is basically what they've been doing, or trying to, for years now. And that signals a problem, because it hasn't worked all that well. So, if the business model is dead, a few organizations believe they've found a way to make it work ... sort of. On June 29, 2012, NPR's "This American Life" producer Sarah Koenig reported on a company called Journatic [formerly at http://journatic.com/], that claimed to be producing local journalism in a new way. What was their secret? They hired people in the Philippines to write about local news in small towns across the U.S. Churning out content with no context. They talked in the story about a Chicago suburb known as Flossmore. Journatic and its client Tribune Local claimed Flossmore didn't have any local coverage. But that was not true, either. Flossmore had a weekly known as The Southtown Star. Author P.S., August 16, 2013: Hyper-local news was seen as a way for companies to make a killing as hometown newspapers disappeared nationwide. Unfortunately, even big players have not found that to be a revenue generator. The NPR program "On the Media" featured a segment called "Patchy". That comes from Patch, which was supposed to be AOL's hyper-local reporting site. Unfortunately, Patch announced it was cutting its staff of 1,100 nearly in half. Brooke Gladstone talked with the Wall Street Journal's Keach Hagey about what that development means for local reporting and about AOL CEO Tim Armstrong's snap firing of an employee during a Patch-wide conference call. 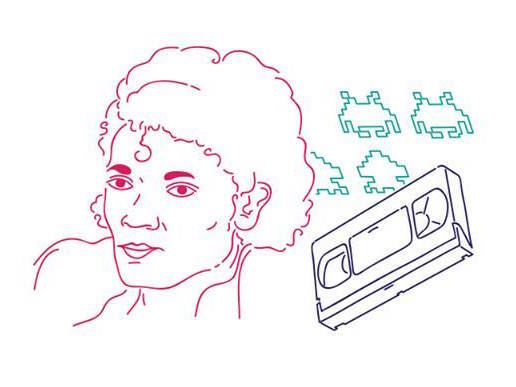 Listen to that by visiting http://www.wnyc.org/story/312949-patchy. While I'm on the subject of newspapers, we lost a cultural icon a few weeks ago: Pauline Phillips, who wrote a popular syndicated newspaper column under the pen-name "Dear Abby" (Abigail Van Buren), who died on January 16, 2013. Her real name was Pauline Esther Phillips and she died at age 94, although she had been ill for a number of years with Alzheimer's disease. "Over the past quarter century, Alzheimer's disease has stolen away bit by bit her remarkable intellect, but she battled her illness with courage and dignity. She was my best friend who can never be replaced." She signed off as Jeanne Phillips, aka Grieving in Minneapolis. The strength of "Abby" gave way to the human vulnerability and grief which all Alzheimer's Disease families share. In that letter, Jeanne also gave special recognition and thanks to her mother's long time caregivers who tended to Pauline 24/7 for over 11 years, a task certainly not all are cut out for. In fact, Pauline had not been writing the column for a while. In December of 2000, Pauline's daughter, Jeanne, now age 70 herself, joined her mother in her work. Then, in August of 2002 the Phillips family announced that Pauline had been diagnosed with Alzheimer's disease, and Jeanne officially took over the role and title of "Dear Abby" since her mother was unable to manage the responsibility in her later years. Today, the "Dear Abby" column is carried on by her daughter, Jeanne Phillips, who owns the legal rights to the pen-name "Dear Abby". For a period in the mid-1960s to the mid-1980s, Pauline and her twin sister Esther "Eppie" Lederer, wrote a very similar syndicated column under the pen-name "Ann Landers", dishing out very similarly-themed letters from the public along with their terse responses. Pauline's sister Eppie passed away in June 2002. 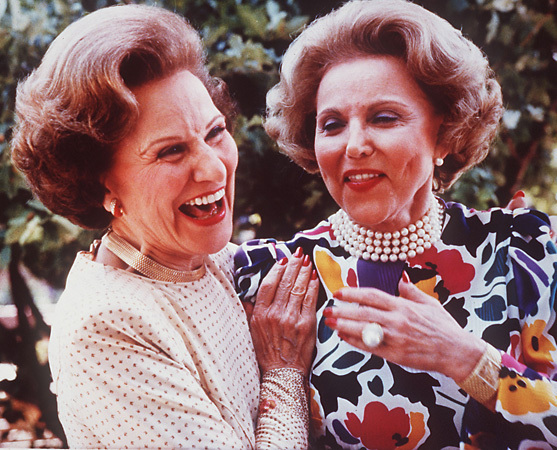 At the time of Eppie's passing, her daughter Margo Howard said that the "Ann Landers" column would end in accordance with her last wishes. The "Dear Abby" column really became a pop culture icon. "Dear Abby", however, has continued, and it remains one of the most-widely syndicated columns published (her daughter Jeanne Phillips continues the tradition), yet the newspaper industry has changed significantly during that time. NPR featured a nice remembrance of this American newspaper legend.